Kebo means “buffalo” in Balinese, and Edan means “crazy” in Javanese. 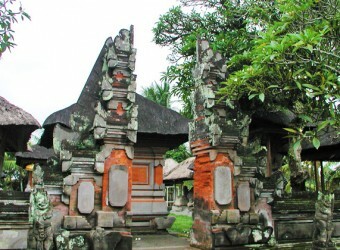 Name of Kebo Edan Temple is interesting that combine 2 languages. It is also famous for the Dancing Shiva statue which has four penises. The God holds snakes on arms and legs and step on the dead person. The temple was Buddhism temple, however, now it is worshipped to Hinduism temple. It is a very quiet temple, no other tourists came here. This temple is full of wonder. Many Hindu people visit this temple when there is an event here. Inside the temple is decorated with many kinds of sculptures.